Rice is a backpacking staple for a reason: it's packed with carbs, protein, vitamins, fiber, and minerals to keep you going on the trail day after day. It's also a no-nonsense grain, with very little prep or cooking skills needed to whip up a delicious rice dinner (because no one wants to do much after slogging into the mountains with a giant pack and sore feet). We've put together our favorite rice bowl meals for backcountry trips - all you need is a few ingredients and a cooking pot. Try these easy solo backpacking dinners or double/triple/quadruple the recipes for larger parties (or leave them to fend for themselves, it's been a long day after all). For starters, we need rice. White rice is the backpacking go-to, with high carb content and super speedy cooking time. It's also quite cheap compared to other rices, so you won't have any buyers regret when scarfing it down. Choose short-grain instant white rice for a quick cook and energy recharge after a long day on the trail. For a more nutritious and slightly more flavorful rice, instant brown rice is also a great option. It cooks quickly and packs more of a flavor punch than white rice. Follow package directions or your supreme chef instinct when it comes to water and cooking time, and use your lid to keep that simmering goodness covered. Once you've mastered the rice, we're ready to get bowling. This hearty dinner will fuel any backcountry trip and remind you of warm home cooking - even when your home is a tent and your warmth comes from a down sleeping bag. Cook 1 cup rice according to package directions, but add an extra 1/2 cup water and one chicken bouillon cube to the cooking water. Once rice is ready, stir in 1 pouch of pre-cooked chicken and 1/4 cup dehydrated veggies (peas, corn, red peppers, carrots, tomatoes, etc. work well). Once the veggies and chicken are warmed up, remove from heat. From your Spice Missile, season with garlic powder and paprika to taste. Easy dinner with a flavor explosion. Cook 1 cup rice and transfer to bowl. Rehydrate 1 packet of powdered coconut milk according to packet directions over heat and add chicken packet. Add 2tsp curry powder and 1tsp garlic powder, then pour over rice and stir. Craving a little Mexican food on the trail? We've got you covered. Cook 2 cups instant rice according to package directions. Pour into bowl. Rehydrate one package (or about 7oz) of dehydrated black beans to the pot and rehydrate according to directions. Add to bowl with rice. Top with some dried cilantro and taco seasoning. Top with shredded cheese if desired. Cook 1cup rice and transfer to bowl. Fry egg or rehydrate dehydrated egg over heat, then add to bowl and stir into rice. Add 1tbsp bacon bits, 1tsp maple syrup (in a condiment bottle), dried pepper, and hot sauce (in a condiment bottle) to taste. Stir and enjoy your breakfast bowl for dinner! 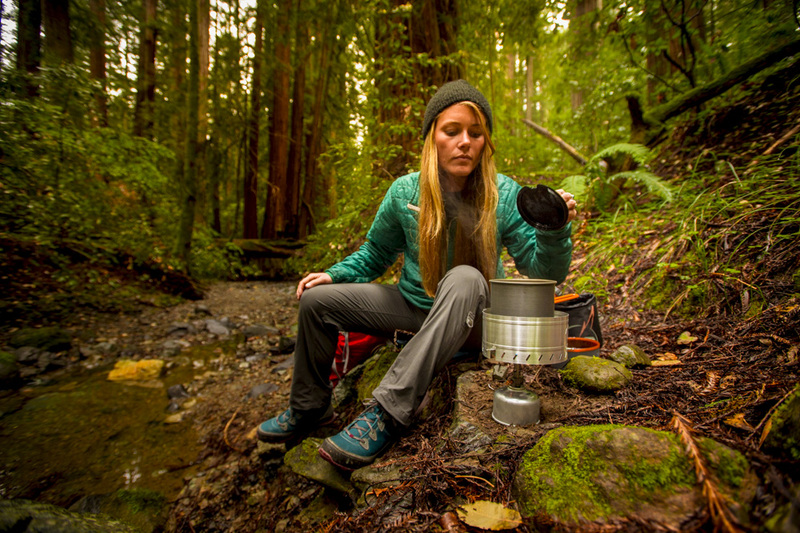 Fuel your thru-hike, solo weekend trip, or quick jaunt into the forest with a classic backcountry rice bowl - and don't forget to share you photos of dining in the great outdoors with us! Soft Sided Condiment Bottle Set- 2 fl. oz.